Infuse Marketing moderated the 4th annual Make the Connection SF event. Posted on July 26, 2012 by Infuse_cb2017 wrote in AEC industry, Facilities Management. It has 0 Comment. 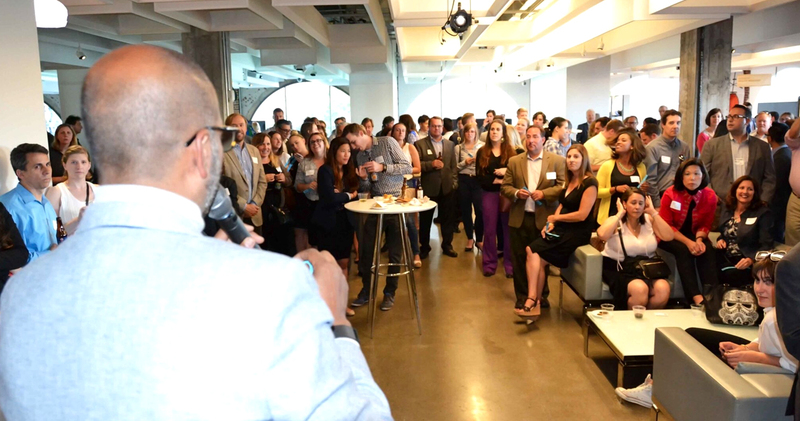 The 4th annual Make the Connection (MTC) event was held on July 26th at the Steelcase Showroom in San Francisco’s SOMA neighborhood. As an active planning committee member and event sponsor, Carmina Bacani, Owner/Social Media Strategist of Infuse Marketing moderated the evening’s festivities. It was another successful event yielding over 300 attendees. The evening delighted everyone with raffle prizes, hors d’oeuvres, wine and valuable networking. Make the Connection is an annual mixer that unites professionals from the architectural, engineering, construction, facility management, green building, interior design and marketing communities in Northern California for an evening of conversation and cocktails. Presented by AIA, IIDA, IFMA, SMPS, USGBC and CICA. Each year the proceeds from the Make the Connection event benefit a local 501(c)(3) nonprofit in the Architecture, Engineering or Construction industry. This year, MTC was able to donate $3,500 to 2012’s beneficiary, The 1%, a program of Public Architecture. On Behalf of MTC’s planning committee, we’d like to extend our warmest thanks to One Workplace and Steelcase for donating their wonderful space for this year’s venue, all event and in-kind raffle sponsors, volunteers and the MTC planning committee. Lastly, thank you Douglas Sandberg for capturing another wonderful video. Click here to view the video highlights from 2012’s MTC event! See you all at next year’s event! 2012 Make the Connection Video Mixer, San Francisco from Carmina Bacani on Vimeo.